Quiz: Which “Natasha, Pierre & Great Comet Of 1812” Character Are You? Are you a Natasha or a Mary? Or maybe a Pierre? What do you think about Anatole? If someone cheated on you what would you do? I have no friends, no, never go anywhere. Never invited to anything. I have to focus on taking care of my family. I spend too much time being depressed to have friends. 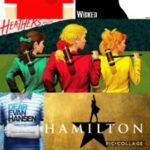 What’s your favorite song from the musical? I never went to sleep. I’ve been in the club for days! What do you think about Pierre? Finally, do you believe Natasha, Pierre & the Great Comet of 1812 was robbed at the Tonys? Previous article The Best Choreography On Broadway!